After two months of driving the new Nissan Leaf 13,000 kilometers from Poland, adventurer and explorer Marek Kamiński arrived at Dongfeng Nissan’s Intelligent Mobility Experience Center in Beijing last July 16. Kamiński’s No Trace Expedition project is raising awareness about how an electric car, which is normally associated with urban environments, can also travel long distances through the wilderness, and at the same time positively influence the environment. 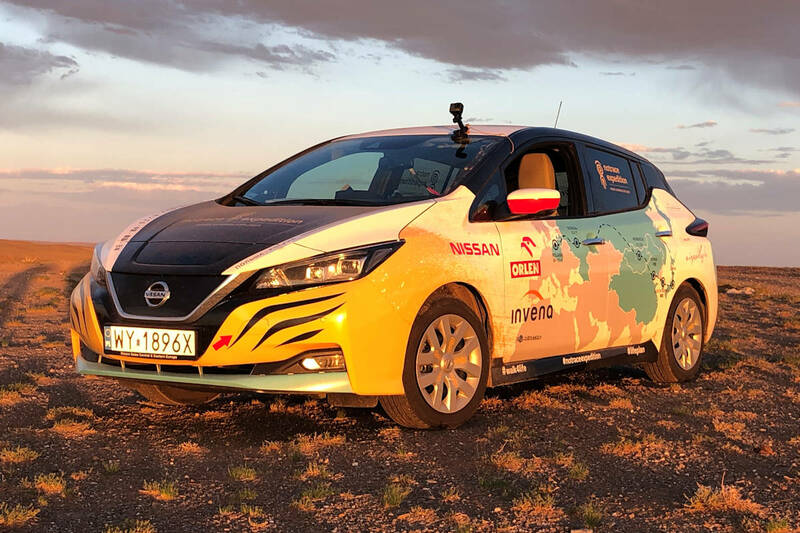 From May to September, 2018, Kamiński is driving the new Nissan Leaf alone through Kaliningrad, Lithuania, Russia and Siberia, Mongolia, China, and South Korea on his way to Japan. Kamiński said the idea for his No Trace Expedition began with trips to the two ends of the earth where he was inspired to plan a journey that had as little impact on the environment as possible. Kamiński said he is trying to overcome the perception that EV technology is still considered by many to be new and not fully supported by infrastructure. “Reliability and cruising range of the vehicle was my first concern,” said Kamiński. For Kamiński, the cumulative mileage history of all the Leafs that are or have been on the road was proof of the EV’s reliability. As an affordable, popular mainstream product, he said finishing the journey in a Leaf will be more meaningful, showing it can take the rigors of varying road conditions and distances. Aiding Kamiński on his adventure is ProPILOT, a component of Nissan Intelligent Mobility that provides additional convenience to drivers. Currently, 72 percent of new Nissan LEAF buyers have chosen the optional ProPILOT system. Since launch in 2010, global sales for Nissan LEAF have exceeded 340,000 units, making it the world’s best-selling electric vehicle. It’s also is the best-selling EV in Europe, with the 100,000th Leaf just recently delivered there recently. The zero-emissions car received the “2018 World Eco Car” award at the New York International Auto Show and has earned 5-star safety ratings for new vehicles in Europe and Japan, among other accolades. When talking about the new energy vehicle markets in China and Europe, Kamiński commented that government efforts on promoting new energy are unprecedented. In many European countries, such as Lithuania and Poland, electric cars can be charged for free. China has now become the largest new energy vehicle market in the world and is a strong testament of the Chinese government’s unremitting effort in energy-saving and emissions reduction. In terms of infrastructure, charging facilities can be seen everywhere in China, which provides convenience to electric car users. Care to Race a Pick-Up Truck? San Juan City Implements "Anti-Idling Ordinance"